I have initiated a position in Starhill Global REIT ("SGR") at $0.715 in March. At this buying price, it is trading at 21.4% discount to its adjusted NAV/unit of $0.91. 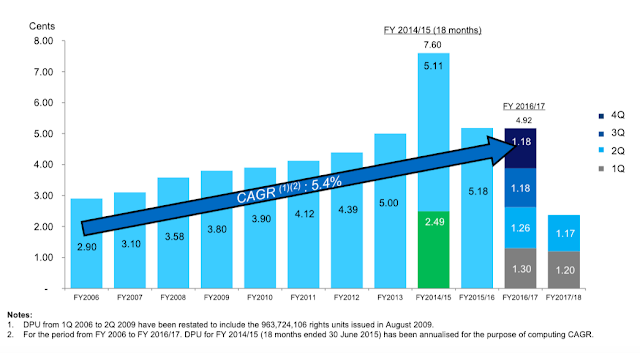 This also translates to a distribution yield of 6.49% based on the annualised 2Q FY17/18 DPU of 4.64 cents. As this is my first write-up piece to analyse a listed company, please bear with me if it is inadequate. Any feedback is welcomed as well. Despite the diversification of properties across countries, majority of the asset value (68.3%) and gross revenue (62.5%) are still derived from the 2 properties in Singapore. 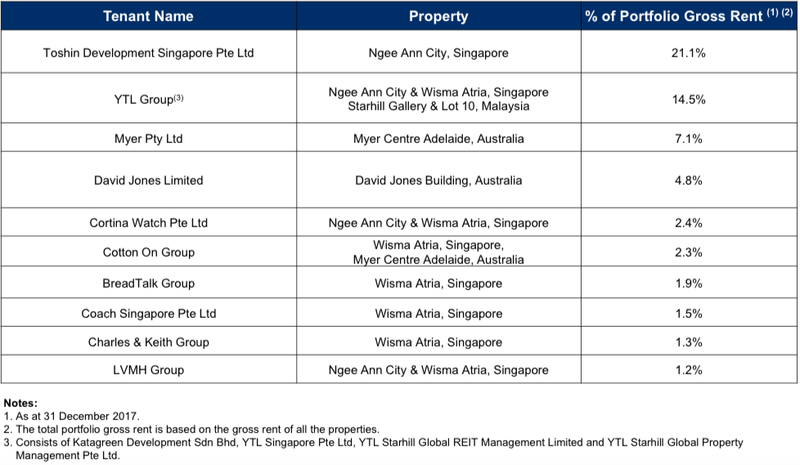 As you can see, 7 out of the top 10 tenants are based in Singapore. 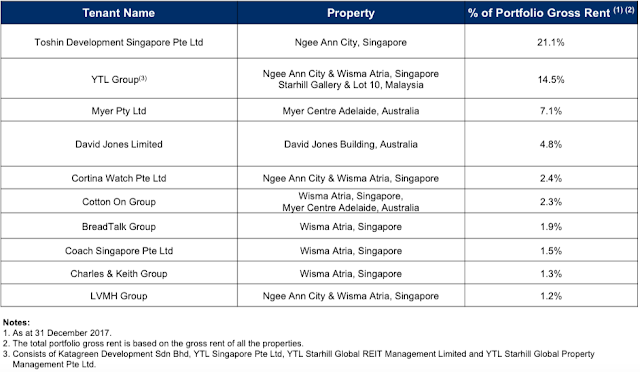 Examing closely, the top tenant, Toshin Development Singapore Pte Ltd accounts for 21.1% of the Portfolio Gross Rent. It is one of the core companies of Takashimaya Group, that manages the specialty stores area of Takashimaya Shopping Centre located from basement 2 to level 4 of Ngee Ann City. Having such a heavyweight tenant can be a double-edged sword. It can pose a large concentration risk to rely heavily on such tenants in the event that the master lease being terminated. 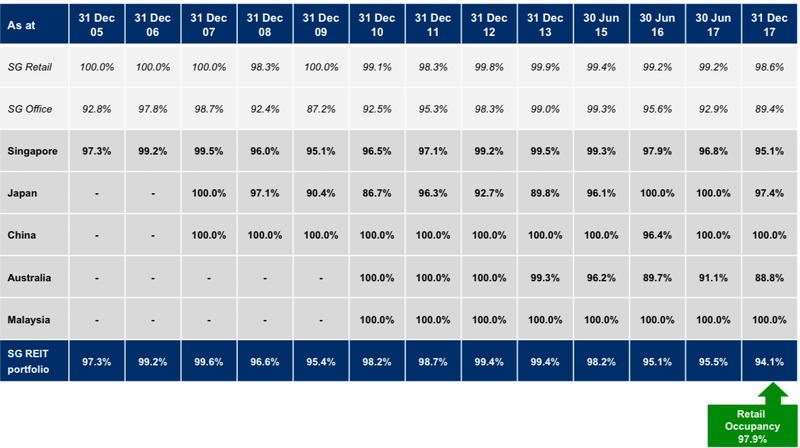 On the flip side, the revenue and NPI for Ngee Ann City were largely stable on the back of the Toshin master lease. As part of the organic growth from rental reversion, SGR has increased 5.5% in base rent for its Toshin master lease from June 2016. The master lease to Toshin provides SGR with potential rental upside every three years, with the next rent review taking place in Jun 2019. You would probably remember the rent dispute between Takashimaya and Ngee Ann Development back in 2016. The dispute does not involve SGR as the space occupied by Takashimaya is not part of its portfolio. Based on the financial statement of 2Q FY17/18, the DPU is reported to be 1.17cents, a decline of 7.14% year-on-year ("y-o-y"). Furthermore, the DPU for the 1H FY17/18 has declined 14.84% y-o-y, a worrying trend of decling DPU, which might have been the cause of SGR trading near its 52 weeks low of 0.70. The main occupancy-related factors that contribute to lower NPI comes from higher office vacancies in Singapore and Australia properties. The NPI has declined 10.7% for Wisma Atria and 26.3% for Ngee Ann City offices 2Q FY17/18 y-o-y. The contribution from Singapore offices accounts for 9.89% of the total NPI in the quarter. Even though the committed occupancy rate for offices in Ngee Ann city has increased from 77.9% in Sept 17 to 88.8% in Dec 17, there is still more room for improvement amidst the competitive landscape of office sector. 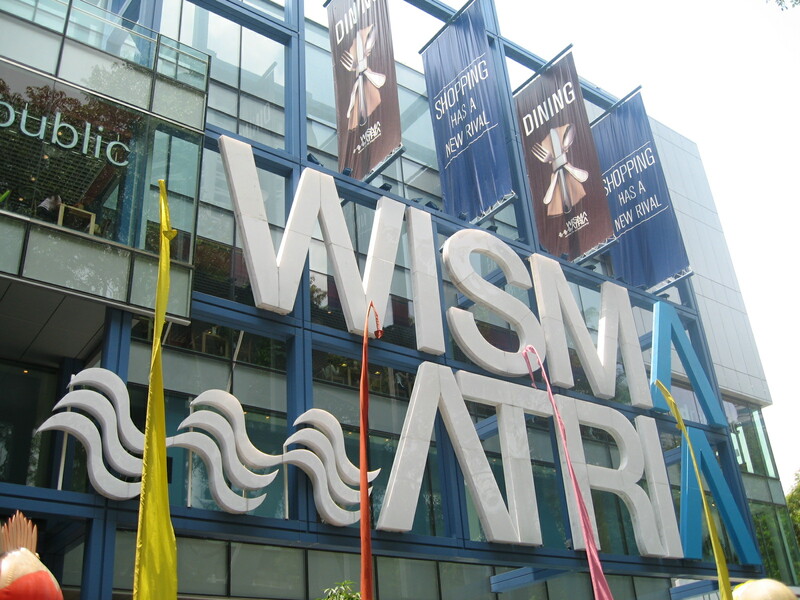 For the retail space, the lower occupancy rate in Singapore has been dragged by 1.5% decline in the occupancy rate for Wisma Atria. To put this in perspective, the contribution from Singapore retail accounts for 53.51% of the total 2Q NPI. 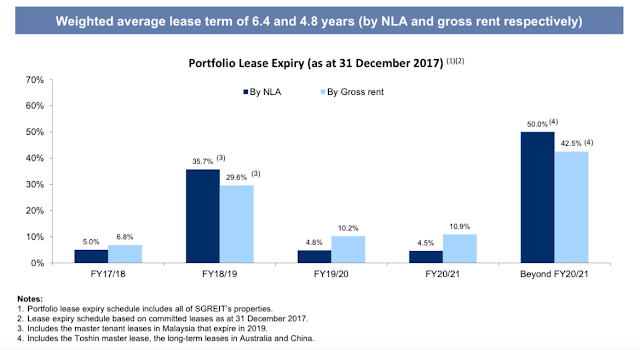 In the near term, it is observed that 35.7% of the portfolio lease by NLA will expire in FY 18/19. The relatively larger lease expiry percentage is due to the master lease with Katagreen Development Sdn Bhd ("Katagreen") which will expire in 2019. Katagreen, being an indirect wholly owned subsidiary of YTL Corporation Berhad ("YTL"), is the master lessee for Starhill Gallery and Lot 10 Property. The master lease with Katagreen has commenced from June 2010 as a fixed term of 3+3 year with a further third 3-year term recently extended in June 2016 with a 6.67% rent increase. Given that Katagreen is a subsidiary of YTL, which is also the parent company of SGR's REIT manager, coupled with the recently completed rejuvenation works for Lot 10 and long-standing lessor-leasee relationship, it is in my opinion that the master lease is likely to be continued. Underpinned by master and long-term leases, SGR's WALE stands at 6.4 years and 4.8 years by NLA and gross rent respectively. Comparing to its fellow retail peers (Mapletree: 2.7 years, SPH Reit: 2.1 years, Suntect Reit: 2.35 years, Capitamall: 1.9 years), SGR faces a lower vacancy risk with its comparatively longer WALE. SGR has a gearing ratio of 35.3% as at Dec 2017. Benchmarking against the 45% leverage limit set by MAS for REITS, this provides SGR some financial flexibility and debt headroom for any future acquisition if the opportunity arises. Set side by side to its fellow retail peers (Capitamall: 34.2%, Mapletree: 36.3%, Suntec Reit: 36.8%, SPH Reit: 25.4%), SGR has a comparable gearing ratio. The weighted average cost of debt per annum increased from 3.09% in 2016 to 3.16% in 2017. 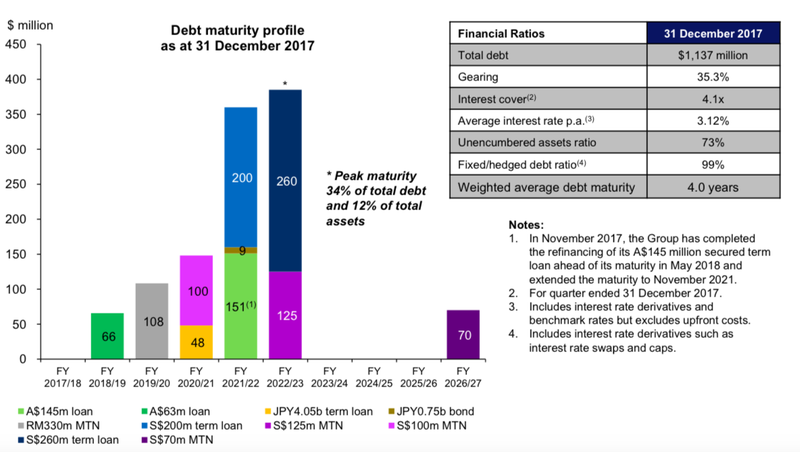 The average debt maturity has increased from 2.6 years to 4.0 years after the completion of the refinancing of secured term loan in Nov 2017, with no significant refinancing requirements until Jun 2019. It can be seen that bulk of the debt repayment (31.66% and 33.86%) will be due in FY 2020/21 and FY 2022/23 respectively. Based on its financial statement, it is noted that SGR's foreign currency exposure is hedged by foreign currency denominated borrowings (natural hedge) and short-term foreign exchange forward contracts. Its interest rate exposure on its borrowings is 99% hedged by fixed rate debt and derivative financial instruments such as interest rate swaps and caps. This is especially crucial given that more interest rate hikes by the US Federal Reserve are expected in 2018. The redevelopment works in Plaza Arcade is expected to be completed by 1Q18, anchored by Japanese fashion retailer, UNIQLO. The renovation will increase the property's retail space by 33%. Lot 10 internal rejuvenation is largely completed. In conjunction with the new Bukit Bintang MRT station, external works to create a new entrance from the station exit for Lot 10 is expected to be completed by 1Q18. The China Property has secured a new long-term tenant, Markor International Home Furnishings Co., Ltd, one of the largest furniture retailers in China. This new long-term tenancy agreement, which incorporates a fixed rent with periodic rental step-up, will replace the department store model. Renovation is expected to be completed by end 2017. Cortina has closed almost all of its watch boutiques in Wisma Atria after what is believed to be the local watch retailer's failure to renew their leases at lower rentals. Seeing that Cortina being one of the top 10 tenants that contributes 2.4% of the Portfolio Gross Rent, this might have a negative impact on the SGR's gross revenue. The emergence of e-commerce has inadvertently disrupted the traditional retail businesses. The challenge is exacerbated by the rise in suburban malls in the neighbourhoods, a double whammy for the businesses in the prime Orchard shopping district. To tackle the imminent threat, there has been an increasing importance of developing omni-channel business models to complement the growth of e-commerce. With no known acquisition pipeline at this stage, SGR might have to turn to organic growth opportunities. Comparing to the other retail peers (CapitaMall, SPH Reit, Suntec Reit and Mapletree) which are currently trading at either a premium or smaller discount to its book value, I have initiated position in SGR with a 21.4% margin of safety. The decision has also taken into consideration the hedging against interest rate and foreign currency risk exposure, moderate gearing ratio as well as the longer WALE. Furthermore, with the asset redevelopment works on Plaza Arcade and Lot 10 to be completed by this quarter, a corresponding positive contribution to the NPI by these properties might be observed. To add on, the renovation of Food Republic's first flagship outlet at Wisma Atria which was completed in Nov 2017, might see an increase in the shopper traffic to the retail mall.